A handy tool for fixing your guitar's output jack. One of the things that can be frustrating with guitar maintenance is the output jack. When trying to tighten a loose nut it is so easy to spin the jack around, risking damage to the wires connected to your jack. And if they are broken, re-soldering them, and then trying to tighten the nut up again without breaking the connections again. Wouldn’t it be great if there were a tool that could be used to hold a jack in place? It’s amazing that it’s taken so long for someone to come up with a solution to this problem, but guitar teacher Chris Shahin has finally come up with a solution. The JackTight is a simple tool that clamps the inside of the jack to the JackTight, stopping it from moving. this allows you to tighten the nut without the jack spinning freely. My Father has been building a guitar with my cousin, and this weekend they were finally up to putting everything together. This was a perfect time to put the JackTight through it’s paces. We hooked the wires required to the jack and proceeded to install the jack as normal. Before tightening the nut we inserted the JackTight as per this tutorial and, tightened the spool, which makes a rubber sleeve expand as it is pressed up against the tip of the JackTight. Once the JackTight has been tightened enough the jack will not rotate once the nut starts to get firm. Once you have the nut sufficiently tight you just loosen the spool, and slide the Jacktight out. The JackTight worked perfectly, and the installation was a breeze. My only real concern was the durability of the rubber sleeve. It looks like it would hold up to quite a few repairs, and with the price of the JackTight at $16.99USD it’s not the end of the world if it broke after a few years, and you had to buy another one. 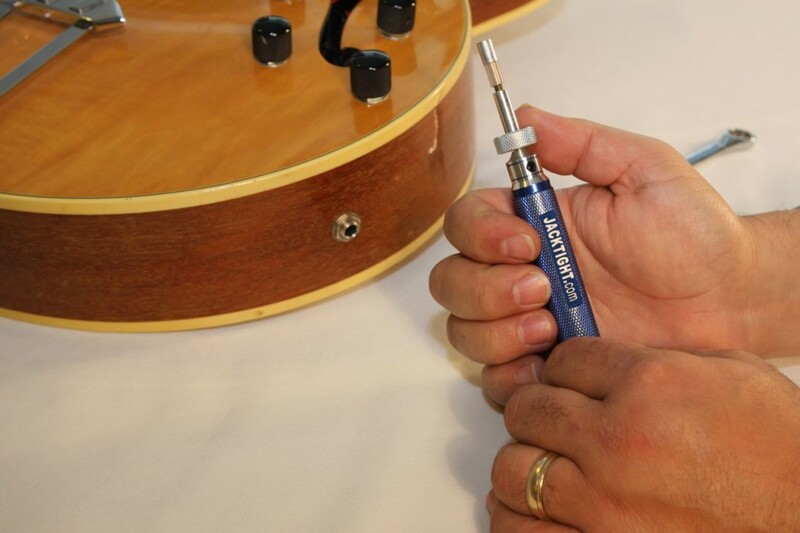 Overall the JackTight is a handy little tool for guitar repairers, luthiers, and DIY hobbyists. It’s not an overly pricey tool, so if you have a few guitars and like to maintain them yourself it’s probably worthwhile buying a JackTight to keep in your toolbox for when you need to fix up an output jack or two. 3 Responses to "Jacktight – review"
Eureka! This is what I have been looking for! The damn jack on my guitar is always loose and sometimes cuts out. That thing is impossible to get tight! This looks like it is just what I need to solve my problems. I don’t want to take the screws out that hold the jack input in place for fear of stripping the holes in the guitar so this should do the trick! you might also want to check out the “Bullet Jack Tightener” from Allparts. it works kind of the same way, but it’s made out of heavy duty high-impact plastic so there’s less risk of scratching the finish if it slips. it’s also a couple dollars cheaper, but both look like great solutions to an annnoying problem, and i could see this being especially useful for tightening endpin jacks on acoustics! i should’ve also added…the Bullet doesn’t require the use of a separate wrench like the Jacktight.